The ’90s brought us many great things. From music, to our clothing and hairstyles choices, the length of our favorite era’s gifts is a long one. As history tends to repeat itself, these four hairstyles have found their way back into today’s culture, making an even bigger statement than before. During the ’90s rappers, including Kid ‘n Play and DJ Jazzy Jeff & The Fresh Prince, along with the box-office success of Do The Right Thing and Lean On Me helped push this trend forward. Many African-American women were depicted in the ’90s wearing box braids including Janet Jackson, in the film Poetic Justice. This stylish trend can also be seen music videos and in other box office favorites like Friday. Did this trend become popular by accident? It seemed either intentional–or just the result of being bored in class LOL. 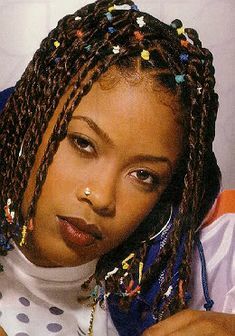 But, that doesn’t take away from the fact that it was a staple of the ’90s and a great protective style. These were seen on virtually everyone in the ’90s at least once–from Missy Elliot to Halle Berry. Finger waves are the one trend on the list, I wish didn’t come back. But I must say, if done properly, they do look amazing.